Abhijit Guha Quantitative Aptitude for Competitive Examinations covers every aspect of the numerical ability section of many competitive tests. This book is highly recommended by many coaching centers of India for all those candidates who are seeking job in Government Sectors as it covers all the important quant questions that are likely to be asked in the upcoming competitive exams. 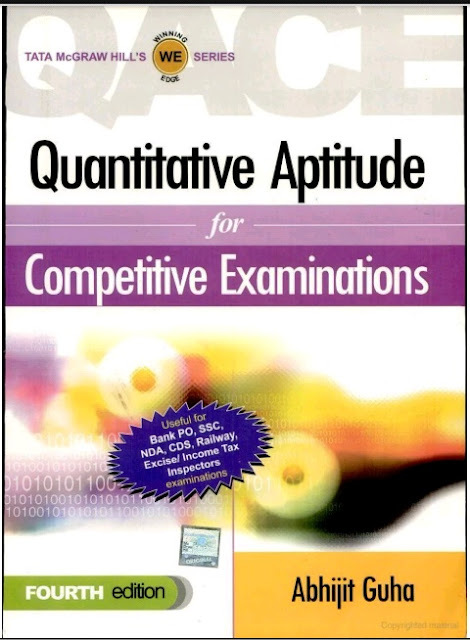 Abhijit Guha Quantitative Aptitude Book is beneficial for students preparing for Bank Exams like PO/ MT,Specialist Officers, Clerical Cadre Exams, CGL Exams, Railway Exams, Police, Defence Exams and various Competitive Exams. Quantitative Aptitude by Abhijit Guha PDF Book covers Number System, Number Series, HCF and LCM of Numbers, Fractions and Decimals, Square Root and Cube Roots, Indices and Surds, Vedic Mathematics, Simplification and Approximation, Problems on Ages and Numbers, Exam Level Test-1, Percentage Profit, Loss and Discount, Average, Ratio and Proportion, Partnership and Share Alligation and Mixtures, Exam Level Test-2, Time, Work and Wages Pipes and Cisterns, Simple Interest, Compound Interest, Growth and Depreciation Exam Level Test-3, Time and Distance, Trains, Boats and Streams, Races Clocks, Calendar Exam, Area of Plane Figures, Volume and Surface Area of Solid Figures, Elementary Algebra, Linear Equations, Quadratic Equations and In equation, Progression, Exam ,Permutation and Combination, Probability, Geometry, Trigonometry Exam, Data Interpretation, Data Sufficiency, Mock Test Papers, Latest Exam Papers etc.